REGINA, Jan. 30, 2018 /CNW/ - Input Capital Corp. ("Input" or the "Company") (TSX Venture: INP) (US: INPCF) announces that it has launched, on a pilot project basis, a new version of its capital streams called a "mortgage stream". 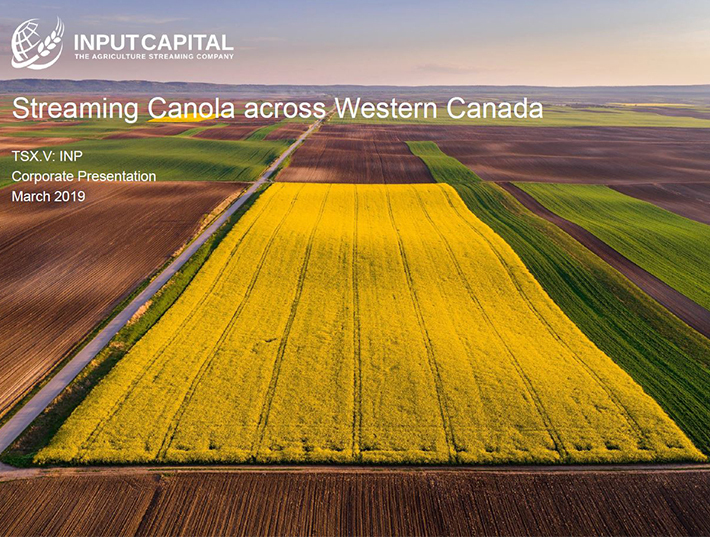 Doug Emsley, President & CEO commented by saying, "Since we began streaming five years ago, we have observed farmers take interest in using canola streams to meet working capital needs in their farm businesses. We have also seen considerable farmer interest in using streaming strategies to finance other types of farm capital like equipment leases and farm real estate mortgages. In response to this customer feedback, our team has developed a conventional farmland mortgage product that uses canola streaming as a payment vehicle. Our intention is to use this pilot period to assess market demand for this product and fine-tune product features prior to formally launching mortgage streams later this year." Last week, Input wrote its first mortgage stream in the amount of $400,000 with an existing client who farms in Saskatchewan. The client was attracted by the idea of making mortgage payments using a canola stream. Input has a growing list of clients who have indicated an interest in the possibility of mortgage streams.